Important decisions are not to be taken lightly, especially when you’re carrying on a family farm. In recent years, farmers have been dealing with steadily rising energy costs and a declining water table. Where they once had plenty of water to flood irrigate, today they have to find ways to make less water go further and further. They see center Pivots as one way of managing their water resources more efficiently as well as a long-term way of keeping their energy and labor costs in line. It’s just a matter of economics, but those economic advantages are made possible not only because of the savings in water, energy and labor, but also because of the way center Pivots give the flexibility to manage the soil for maximum production and the individual crops for maximum yields. Now let’s look at a 10,000-acre farming operation which includes a 15,000-head commercial feedyard in the States. Approximately three-quarters of the land (7,500 acres) is irrigated farmland for raising corn, alfalfa, hard red winter wheat and some occasional grain sorghum. One-third of the total irrigated land is under center Pivots. They were the first farmers to develop flood irrigation in their area. But in recent times, they’ve converted more and more flood ground to sprinkler irrigation to make better use of their water, energy and labor. 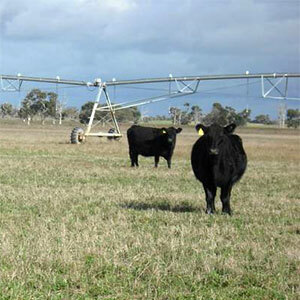 It’s a crop that fits neatly into the cattle program while still providing a significant cash crop. Wheat yields are a little higher under center Pivots, but the real advantage on winter wheat is that mechanical-move irrigation lets apply a timely, uniform preplant watering. A good stand of fall wheat is important because it provides pasture. Once a stand is established in late September, they irrigate once or twice more with center Pivots, depending on available soil moisture. Some 2,000 calves weighing 375-500 lb. go on that irrigated wheat pasture in early November and they come off in late March weighing around 650 lb. for heifers and 700-750 lb. for steers. They try to graze every wheat field at least once for 6-8 weeks before they move to another field. They use portable electric fence and portable watering tanks, and provide some concentrated rations in portable feed bunks along with windbreaks for the winter months. Once cattle are off wheat, they topdress with fertilizer based on soil fertility testing. Two or three irrigations usually follow, and the grain harvest begins the second or third week of June. Their 500 acres of irrigated alfalfa are also important for the feedyard ration. It too requires fairly constant center Pivot irrigation throughout the summer months to produce four cuttings per year. Wheat often follows wheat 4, 5 or 6 years in a row, then they rotate to corn or perhaps alfalfa. When they do rotate a corn field to wheat, or vice versa, the center Pivot allows them to come in immediately after the harvest with the planter or drill. Another 3,000 acres are devoted to corn, almost all of it harvested at high moisture levels (26%) for feedyard use. With corn, they have a dry period at planting time just like wheat, so they use the center Pivots to wet the seedbed prior to planting. They plant several different maturities over a three week period so they can condense the harvest to 10 days in October. The high moisture corn is rolled and packed in bunker silos, providing the basis for the feedyard ration throughout the year. Feedyard manure provides much of the organic fertilizer for corn ground. Additional nitrogen is sometimes delivered throughout the center Pivots, which are also used for chemigation.